Here is the new deal in the Victory Store. Hurry, because it will not last long! 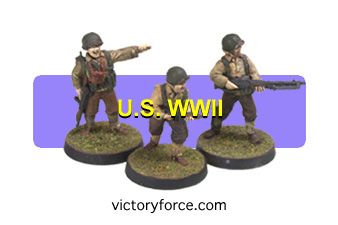 This deal is for 10 randomly picked VFM U.S. WWII Figures. Pack may contain a mixture of Infantry and Paratrooper figures. All figures will be randomly picked. Thats $1.50 a figure compared to the $3.00 per figure for most figures in the range, just because you let us pick what you get. Deal is for a limited time and not good with any coupon codes. Please do not write asking for specific figures, we cannot accommodate your request.